Biologic research is experiencing a transformation brought about by the ability of programmable nucleases to manipulate the genome. 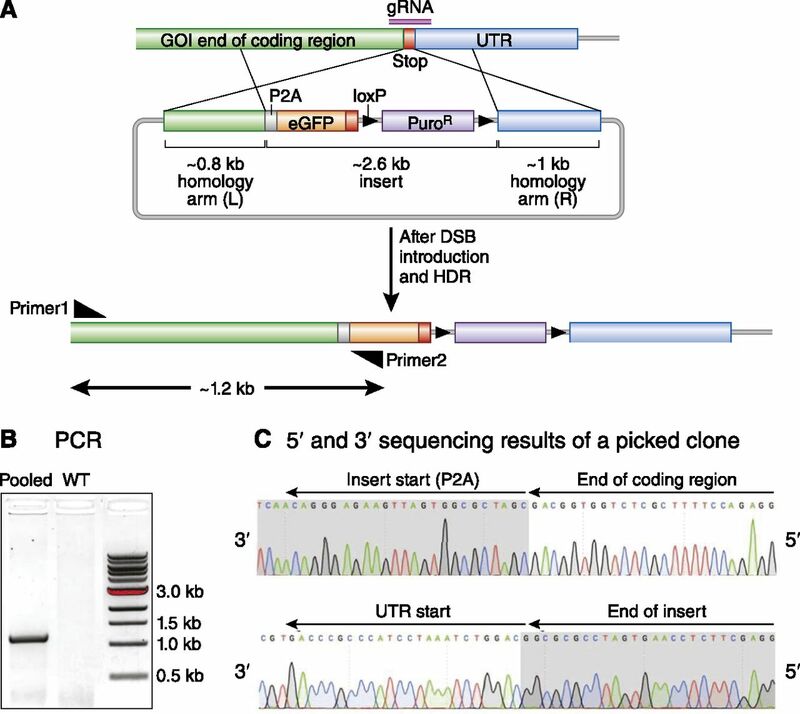 In the recently developed CRISPR/Cas system, short RNA sequences guide the endonuclease Cas9 to any location in the genome, causing a DNA double–strand break (DSB). Repair of DSBs allows the introduction of targeted genetic manipulations with high precision. Cas9–mediated gene editing is simple, scalable, and rapid, and it can be applied to virtually any organism. Here, we summarize the development of modern gene editing techniques and the biology of DSB repair on which these techniques are based. We discuss technical points in applying this technology and review its use in model organisms. Finally, we describe prospects for the use of gene editing to treat human genetic diseases. This technology offers tremendous promise for equipping the nephrology research community to better model and ultimately, treat kidney diseases. Gene editing can be defined as the process of permanently altering cellular DNA sequences to introduce a desired mutation. Although manipulating DNA has formed a foundation for modern biomedical research efforts for the last 40 years, remarkable new approaches are revolutionizing this process. Mutations can now be introduced into the genomic DNA of cells from virtually any species. These advances have been made possible using custom nucleases, proteins that can now be targeted to specific sites in the genome, where they can correct mutations, introduce new DNA, activate or suppress transcription, and perform other functions. Increasingly, these exciting and powerful approaches are affecting clinical applications in addition to basic research. Research into cellular repair mechanisms for DNA double–strand breaks (DSBs) underpins newer approaches to gene editing. Cells have two primary repair pathways: homology-directed repair (HDR) and nonhomologous end joining (NHEJ) (Figure 1). We will discuss a third pathway, microhomology–mediated end joining (MMEJ), below. HDR uses homology regions between the exposed ends of a DSB and a donor DNA template to repair the cut region. By contrast, in the NHEJ pathway, the broken ends of the DSB are ligated back together. Because this process involves processing of the broken ends to generate compatible ends, the repair often results in small deletions or insertions.3 The important concept is that, if one can introduce a DSB at a desired locus, then either mode of repair might come into play, leading to a permanent genetic alteration. As a consequence, investigators have searched intensively for methods of inducing DSBs at a precise location. Simplified schematic illustrating DSB repair mechanisms induced by CRISPR/Cas9. The three pathways, HDR, NHEJ, and MMEJ, are used for different gene editing purposes. The black triangles indicate locations of the cut site. NHEJ leads to frequent small insertions or deletions that can lead to disruptive frameshift mutations and premature stop codons. This approach is best suited for generating point mutants or knocking out a gene. Both HDR and MMEJ pathways can be used to introduce longer DNA sequences, but they each require an exogenous donor DNA template. These mechanisms are well suited for introducing precise mutations or knocking in an epitope tag or reporter gene, such as green fluorescent protein. Modified from Sakuma et al.,34 with permission. Both of these approaches advanced the field considerably, but they also suffer from major limitations. Assembling tandem repeats of ZFs and TALEs is laborious because of the repetitive sequences, and a single ZF nuclease may not be active; therefore, researchers often order several to produce one active nuclease.11 Although TALEs are highly independent of neighboring repeats and not as labor intensive to create, binding sites are limited to sequences that start with a T base,12 and they also require considerable validation. In contrast to ZFNs and TALENs, the recent clustered, regularly interspaced, short palindromic repeats (CRISPR)–associated endonuclease (Cas) system is considerably simpler to design and use. It is also cheaper. A single ZF costs about $5000, and a single TALEN might be $500 if a laboratory constructs it on their own. By contrast, a single CRISPR/Cas experiment costs only the $30 required to synthesize short oligonucleotides. The CRISPR/Cas technology is based on the bacterial adaptive immunity system entitled CRISPR. This system provides adaptive immunity against foreign DNAs, such as viruses and plasmids. The type 2 CRISPR system first identifies foreign DNA, and then, the Cas cuts this foreign DNA into small pieces. These are subsequently incorporated into a CRISPR locus within the bacterial genome. These loci are then transcribed to generate small RNAs, which will eventually guide the Cas endonuclease to that same foreign DNA sequence, on the basis of RNA-DNA sequence complementarity.13–15 A distinguishing feature of the CRISPR-Cas defense is that it uses RNA-DNA binding to guide the nuclease to specific genetic sequences rather than protein-DNA binding as with ZFNs and TALENs. Scientists have simplified the dual tracrRNA-crRNA system by engineering a single guide RNA (sgRNA) that combines tracrRNA-crRNA functions. This leaves a two-component system, in which one can target any DNA sequence simply by introducing the Cas9 nuclease and appropriate sgRNA into target cells.17 An sgRNA target can be any sequence as long as it is immediately followed by the PAM sequence, which is so common that this is not a practical limitation. There are a variety of online resources available to identify genomic loci with unique sequences to minimize off-target effects (Table 1). The sgRNA target sequence is typically synthesized as a partially complementary oligonucleotide and cloned into a plasmid that encodes a cassette for expression of the sgRNA and Cas9. The plasmid may also encode either a fluorescent marker or resistance gene, enabling enrichment of transfected cells. The delivery method varies depending on the cell line: standard transfection methods may be sufficient for easy to transfect cell lines, whereas electroporation or viral delivery can be used for difficult to transfect cell lines. The activity of sgRNAs can be tested by several straightforward methods (Table 2). To knock out a gene, an sgRNA can be designed to bind to the 5′ end of the coding region. After a DSB is introduced and repaired through NHEJ, small deletions or insertions will be created, many causing frameshift mutations that result in nonsense-mediated decay. Alternatively, two sgRNAs can be designed at the 5′ and 3′ ends of the gene to delete the whole genic region (Figure 2A). In the former approach, it may be time consuming to screen clones, because DNA from each clone has to be individually sequenced to identify frameshift mutations. In the latter approach, screening can be carried out efficiently by PCR. For example, Figure 2 depicts one such strategy, in which two sgRNAs flank a long genic region, and the screening primers are located upstream and downstream of the sgRNAs. With a 1-minute extension PCR, deleted alleles yield PCR products, whereas the wild-type allele is too large to amplify (Figure 2). Schematic illustration of a gene knockout using CRISPR/Cas9 gene editing. (A) Two gRNAs were designed on the coding start region and 3′ untranslated region (UTR), respectively, of gene of interest (GOI) to cut out about 9 kb. The light blue rectangles and green rectangles show coding sequences and UTRs, respectively. The screening primers are located outside of the gRNAs. (B) PCR is performed on DNA isolated from individual clones of cells subject to gene editing. The extension time is purposefully brief, so that the 9-kb WT allele cannot be amplified. Different sizes of deleted alleles are detected, because each clone has different deletion lengths near the DSB. To introduce specific genetic alterations, such as reporters and disease-specific mutations, knock-in strategies may be used. In this case, an additional DNA template must be provided along with the plasmid-encoding Cas9 and the sgRNA. This additional DNA must have two homology arms and the desired new DNA sequence in between them. Insertion of small epitope tags can be accomplished with single-stranded oligonucleotides using homology arms of about 60 nucleotides. Insertion of a larger sequence, such as green fluorescent protein, requires a plasmid donor with longer homology arms of around 0.8 kb. When this donor DNA with homology arms adjacent to the cut site is present, the HDR pathway may be triggered, and the novel sequences located in between the homology arms will be incorporated. Figure 3 shows successful introduction of a 2.6-kb insert using 0.8- to 1-kb homology arms. A donor-specific primer and a primer that anneals outside the region spanned by the homology arms should be used to screen clones with knock-in alleles. Clones with the inserted alleles should give PCR bands, whereas wild-type alleles do not (Figure 3B). Illustration of a C–terminal P2A-eGFP–floxed puromycin expression cassette knock-in for gene of interest (GOI) by CRISPR/Cas9 editing. (A) A gRNA was designed to overlap with the stop codon of a GOI, and the donor vector contained homology arms of 800–1000 bp. After HDR, a P2A-eGFP–floxed puromycin expression cassette will be inserted in frame just after the coding region and before the stop codon. Screening primer 1 was designed outside of the left homology arm to prevent detection of the donor plasmid. The insert–specific primer 2 was designed on eGFP. (B) Results of pooled genomic PCR from mouse embryonic stem cells that detects the insertion of the desired sequence into the genome. (C) Sequence results from a single clone indicate precise integration of the desired sequence into the genome. Only the results of the 5′ sequence are shown. UTR, untranslated region. It is best practice to design sgRNAs and donor homology arms in such a manner that the homology arm sequences do not contain the full sgRNA target sequences to ensure that the plasmid donor and repaired locus will not be subject to mutagenic NHEJ outcomes. This can be accomplished by mutating the PAM sequence of the donor plasmid. CRISPR/Cas technology has also been used successfully for large–scale, high–throughput functional screening. For example, by using a lentiviral knockout sgRNA library, a group has identified genes essential for the intoxication of cells by anthrax and diphtheria toxins.30 Their method involved lentiviral infection of human cultured cells with the sgRNA library to establish library cell lines followed by toxin screening. Surviving cells were then analyzed for their individual sgRNA sequence by deep sequencing, thereby identifying the gene knockout that protected the cell from death by either anthrax or diphtheria. One-step generation of mouse knock-ins is also possible, but it is less efficient than creating knockouts. Insertion of small epitope tags can be accomplished by coinjecting an sgRNA, Cas9, and single-stranded oligonucleotide containing the epitope tag and homology arms of about 60 nucleotides. Larger insertions, which require plasmid donors with longer homology arms as described in the previous section, are considerably more challenging to accomplish in a one-step procedure, despite early reports to the contrary.33 Some investigators have resorted to creating the knock-ins in mouse embryonic stem cells using CRISPR/Cas9 followed by traditional blastocyst injection. Although gene editing with CRISPR/Cas9 has been described in myriad other model organisms, including rat, zebrafish, frog, monkey, mosquito, pig, plants, and more, there still remains room to improve gene knock–in efficiency and applicability to organisms with a low HDR frequency. An intriguing recent development, called CRISPR/Cas9 precise integration into target chromosome, takes advantage of a separate DNA repair mechanism called MMEJ to facilitate knock-in. In contrast to the conventional HDR, the MMEJ process requires only short homologous sequences of 5–25 bp. This method features a donor plasmid with short homology arms, and the whole template region is flanked by sgRNA target sites. Therefore, Cas9 generates DSBs in both the genomic DNA and the donor vector, exposing the microhomology sequences that are then used for MMEJ–mediated knock-in of the insert.34 The precise integration into target chromosome system has been reported to have about 2.5-fold higher efficiency than HDR–mediated knock-ins in cultured cells and has been successfully used in silkworm, zebrafish, and frog. It certainly seems to be a promising technique that needs to be tested in mouse embryos.35 Additional studies into MMEJ repair mechanisms might improve the methodology further to enable precise and efficient knock-in of large insertions in whole-animal applications. Recent reports also document the first successful application of gene editing approaches to the study of kidney disease. Freedman et al.36 recently reported protocols for the directed differentiation of human pluripotent stem cells (hPSCs) to kidney organoids. Using CRISPR, they knocked out the podocalyxin gene in hPSC.36 Podocalyxin regulates tight junctions and is expressed in podocytes in mature kidney. After differentiation of wild–type or podocalyxin knockout hPSC to kidney organoids, Freedman et al.36 reported disappearance of protein tracks of the other podocyte proteins synaptopodin and ZO-1 along with a decrease in the gap width between podocyte-like cells.36 This proof of principle experiment establishes a novel platform for investigation of kidney genes in hPSCs. Freedman et al.36 also generated biallelic loss of function mutations in the polycystic kidney disease 1 (PKD1) and PKD2 genes that are responsible for development of human PKD. After differentiation of these lines and wild-type cells into kidney organoids followed by extended culture, Freedman et al.36 observed large cyst–like structures apparently emanating from the tubular compartment in organoids. Although these were uncommon at 6% of organoids, this seems to be a highly promising new approach to model cystogenesis in PKD in vitro. One strategy to cure sickle cell anemia is to activate expression of fetal Hb, HbF, which does not require the β-globin subunit and therefore, does not cause sickling. HbF expression is normally downregulated after 6 weeks of age by a transcriptional repressor encoded by the BCL11A gene.38 A group from the Dana Farber Cancer Institute used a CRISPR/Cas9 to perform saturation mutagenesis on the human enhancer (a noncoding element) that regulates BCL11A expression. The group identified sgRNAs that caused complete knockout of BCL11A, with subsequent upregulation of HbF expression.39 This important work provides a framework for therapeutic gene editing in hematopoietic stem cells to restore HbF expression and ameliorate the sickle cell phenotype. The particular enhancer targeted is specific to erythroid elements, thus preserving BCL11A expression in nonerythroid tissues and reducing side effects. Three independent groups very recently reported CRISPR strategies to achieve exon skipping in the dystrophin gene, resulting in improved muscle function in mouse models of DMD.41–43 These groups (Olson and coworkers,41 Gersbach and coworkers,41 and Wagers and coworkers43) all used adenoassociated viruses (AAVs) to deliver the CRISPR/Cas9 components. AAVs are nonintegrating viruses that are safe for human use, and they efficiently transduce skeletal and heart muscle. Investigators designed novel AAVs that encoded the Cas9 endonuclease along with paired sgRNAs that flank the mutated exon. Simple intravenous injection of the custom AAV resulted in efficient excision of the mutant exon, restoring myofiber and cardiomyocyte function. Wagers and coworkers43 also showed that excision occurred in muscle stem cells, providing hope that this approach may provide a durable cure if adapted to humans. Applications of CRISPR–mediated gene editing to the treatment of kidney disease can be envisioned. For example, the shortage of transplantable organs remains a critical roadblock to the treatment of ESRD. Xenotransplatation of porcine kidneys has been considered a viable solution to this problem, but concerns about transmission of porcine endogenous retroviruses (PERVs) to humans has limited progress in this field. PERVs cannot be eliminated by biosecure breeding, because these elements are encoded within the pig genome. Recently, Church and coworkers44 used a CRISPR approach to eradicate a gene critical to PERV function at 62 independent sites within the genome of a pig cell line during a single round of CRISPR. This result provides a proof of principle that the same approach could be used to create pig embryos with inactivated PERV sequences and subsequently, cloned pigs with kidneys free from retroviruses. PKD represents another potential application for therapeutic gene editing. Most patients develop kidney failure from small mutations in either the PKD1 or PKD2 gene. These types of mutations are amenable to repair by the HDR approach and would only require a relatively short oligonucleotide donor template. Two possible therapeutic approaches might be possible. On the one hand, fibroblasts from an affected patient could be isolated and induced to become pluripotent cells (a standard protocol now). The PKD mutation could be corrected by CRISPR at this point, and the pluripotent cells could then be induced to differentiate into a transplantable kidney, which would have the benefit of being immunologically identical to the patient.36 Unfortunately, it is not clear when or even if a transplantable kidney can be grown in the laboratory. An alternative approach would be to deliver Cas9, a gRNA, and the donor template DNA directly to kidney tubular epithelia in patients affected with PKD and correct the gene defect in all of the nephrons of that patient. Here, the major limitation is that there is no clear method to deliver this DNA to the kidney. The AAV approach seems to be the most promising and is already in clinical trials in other organs; however, there is no evidence of any AAV serotype capable of infecting kidney epithelia. Over just a few years, the scientific community has witnessed the development of a remarkably powerful, flexible, and exciting new tool for studying and manipulating gene function. We have highlighted the development of gene editing and focused on CRISPR/Cas9-based approaches, currently the most flexible gene manipulation available. These technologies offer the rapid, inexpensive, and efficient targeting of one or multiple genes and are easily accessible for any laboratory environment. These approaches offer powerful new tools to those studying kidney disease and are sure to play an increasingly important role in both kidney investigation and therapeutics in the future. The authors thank Beno Freedman for helpful discussions. Work in the laboratory of B.D.H. is supported by National Institutes of Health/National Institute of Diabetes and Digestive and Kidney Diseases grants DK107274, DK103740, and DK103050; Established Investigator Award EIA14650059 of the American Heart Association; and Biogen Idec.